It’s that time of year again! 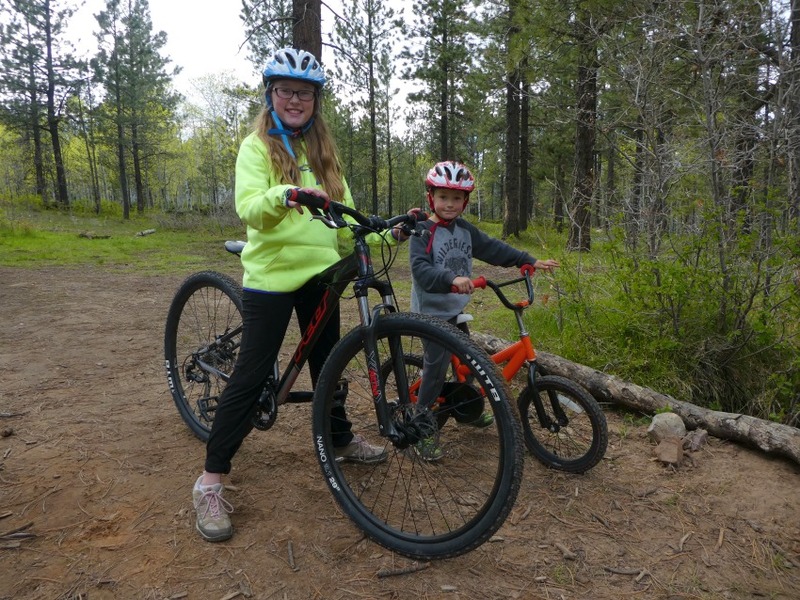 The weather is fantastic, the kids are out of school, and it’s an ideal opportunity to have a family mountain biking adventure. As a family, our kids have reached an age (5 and 11) where we have fully embraced this outdoor activity together. We’ve made some mistakes, but picked up some valuable tricks along the way. Here’s how to select a good location, along with my best advice on how to make this an awesome adventure for your family. 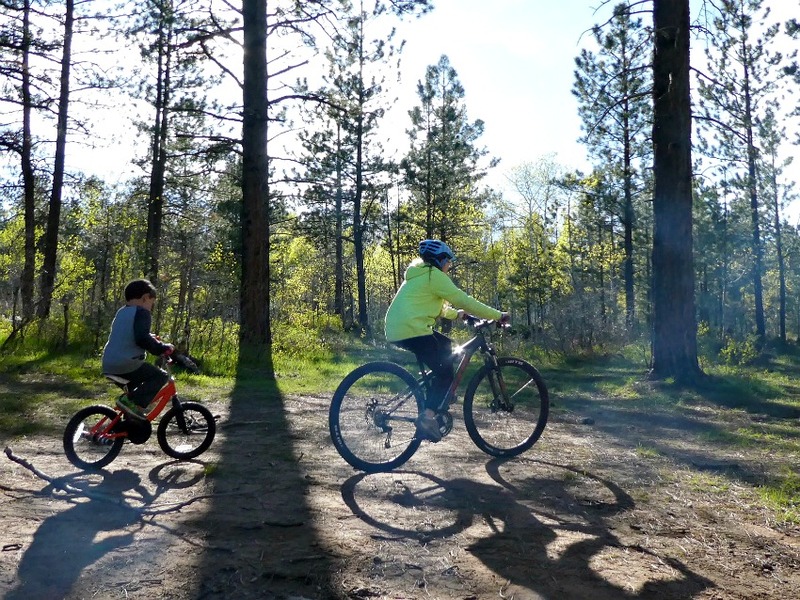 You’re ready to tackle a family biking adventure, and are not sure where to start. Even just transporting multiple bicycles to a trail head or other fun location can seem daunting. Please be assured that this is a worthwhile memory-making endeavor, and one that everyone will enjoy. Here’s a few things to consider beforehand and bring along on your ride, to help things go more smoothly. 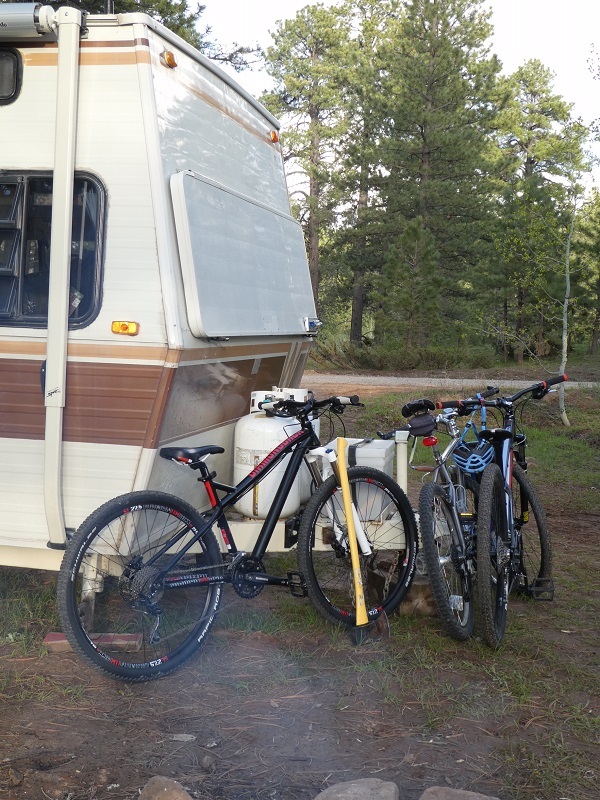 My family recently headed out for a weekend of camping and family mountain biking. We chose a public lands area where the spaces are wide open, trails are plentiful, and the rules are fast and loose. The unexpected downside? Motorized vehicles are also allowed on all trails, and the ATV action was in full swing during this busy holiday weekend. 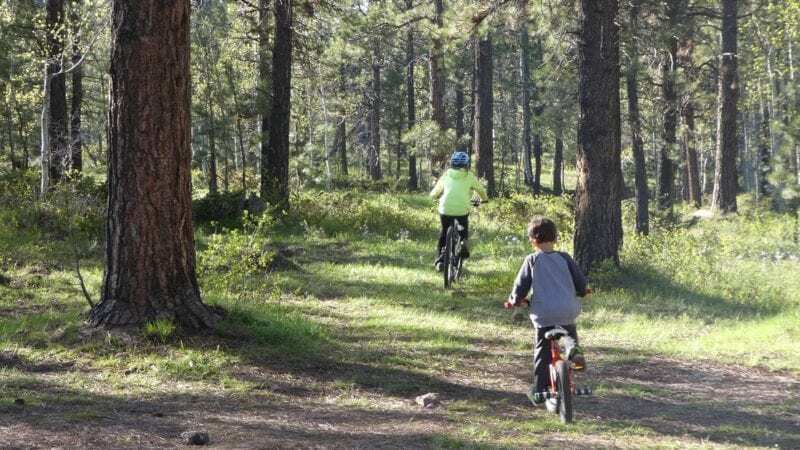 Bottom line, the trails weren’t really safe enough for a family with two young kids to ride their bicycles. We improvised by sticking to our own loop we forged through the trees near our campsite. Had we known in advance, we would have selected an area with dedicated mountain biking trails. This assures you won’t have to compete with any ridiculously fast, noisy gas guzzlers barreling past your child riding his bike. Don’t get me wrong, those Razors look incredibly fun. I just don’t want to try and compete with one on a trail. It pays off to do some research ahead of time, on a trail you are considering. Biking trail maps often rank the difficulty with symbols, similar to ski trails. It will also give you a good gauge on what distance to expect. My husband and I once snuck alone out for a Date Ride at the legendary Fruita, Colorado mountain biking trails. We wanted to use the opportunity to explore the area, so we’d know where to take the kids with us at a future time. We made it back to the parking lot, both invigorated by our ride, only to discover… we’d been doing it wrong. 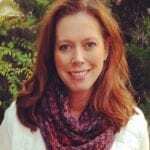 Our semi-critical mistake? Not consulting the posted map in the parking area until after our biking adventure. We discovered too late that we’d spent the first half of our ride ascending on a one way, descending only trail. In the wrong direction. Which was not only rude, it was potentially dangerous. Who knew? Well… now we know. And now you know, too. Be aware that mountain biking trails may have rules such as this, and for a good reason. Consulting a map ahead of time can save you some embarrassment, and perhaps even a colossal bike wreck. This one’s easy, if not a bit unattractive. Pant legs can easily get caught in your bike chain. Not to fret, there’s an easy fix. Remember how we used to “tag” our pants in the 90’s? No? Well… Google it real quick. That’s right. It’s a way to roll your pantleg so it’s narrow at the bottom. Do this for any family member wearing loose legged pants. Generally the crankshaft is on the right side, so you really only need to tag your right pant leg. Unless you really wish to embrace the look. Then do both sides. Wear it like you own it. You’ll be able to cover the miles much more enjoyably if you’re on the right bike. For years I rode a mountain bike that was just a bit too large. I got a great deal on it, and I love the color. That’s about all that matters… right? Ah, wrong. Heads up, moms. These days there are bikes made specifically for women. And it can mean much more than just the additional standover clearance. It means an easier, more comfortable, and much more enjoyable ride. Look for the newer, larger sized 27.5” wheels to give you additional capabilities in rolling over obstacles easily. I love how solid and confident my Diamondback Lux Comp women’s mountain bike makes me feel, with its special saddle (seat), handlebar, and grips formed just for women. This year we also determined my 5th grader has officially outgrown her Barbie bike, and it was time to upgrade to a larger “real” bicycle. At this transition age of 10-11, your child can very likely start on an x-small or small adult sized bicycle frame. A good bike shop will let your child test drive some options outside the store. It often means their first time with a hand breaking system and shifting gears, so they’ll have a brand new feel to deal with. Having a bike they feel comfortable on is crucial. 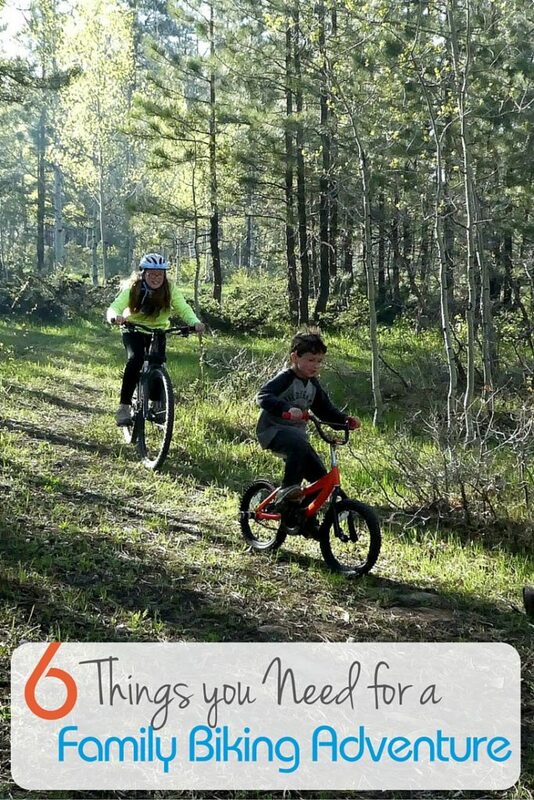 This is particularly valuable if your child is new to riding a mountain bike (vs their first, original bicycle they learned to ride on). Riding on trails, in my opinion, is a million times more fun than riding on a concrete sidewalk. But it takes some getting used to. We had our kids spend a weekend just practicing in a small forested area. They gathered sticks and rocks, and together we built a mini obstacle course. Weaving between carefully placed rocks on a dirt trail helped them hone their navigation skills. Crossing stick bridges built confidence in crossing small obstacles in their path. One broken bike chain and a few bruises later… they are all pumped up and ready to tackle bigger terrain. 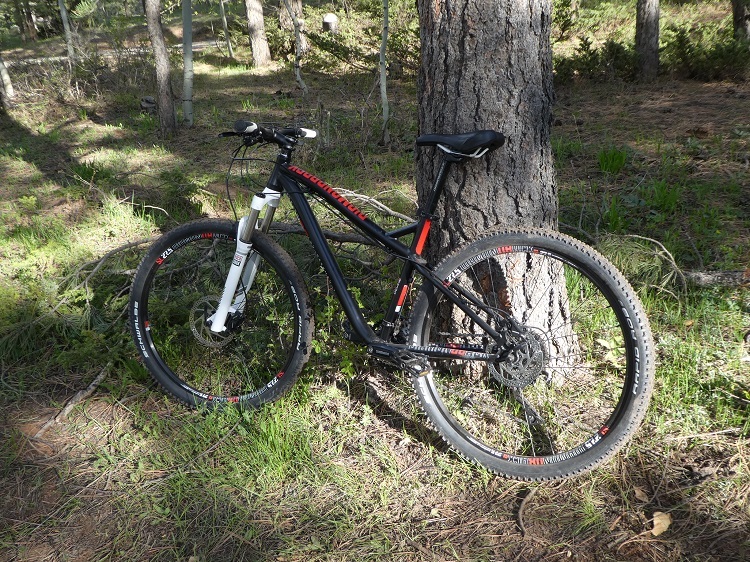 This was a great trial run before biking miles away from a vehicle at a trailhead somewhere. I realize this tip is boring, but it’s important. Wearing a helmet is a great habit to get into, and well worth any hassle or perceived discomfort. These days helmets are well designed, light-weight, and feature great ventilation and adjustable hatband tension. My kids don’t mind theirs at all, and wear them even on short rides or when just messing around on their bikes for a few minutes. Parents, please set a good example and wear one yourself. As a child of the unrestrained, no-safety-belt 70’s myself, I’ll admit I wasn’t initially good about consistent helmet wearing. Once I found a light, comfortable helmet it wasn’t that big of deal. We’ve had good success with both Lazer Helmets and Nutcase Helmets. 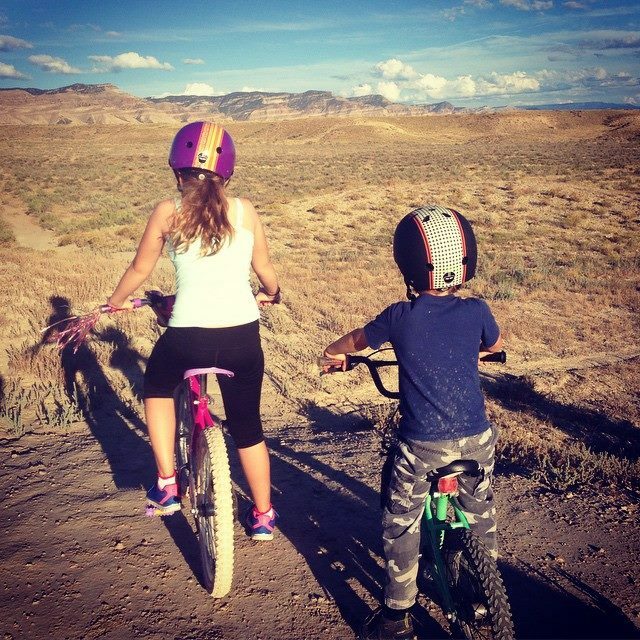 Make protecting that noggin a routine when you mountain bike, and your kids will happily follow suit. There’s so much fun to be had when your family enjoys being active in the outdoors. 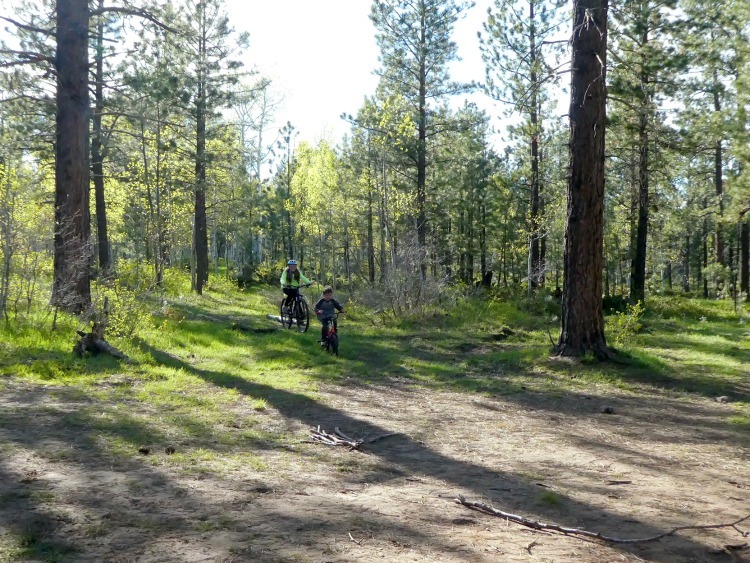 Most kids adore riding their bike, and doing so on a gorgeous and exciting dirt trail takes it to a whole new level. Be safe out there, and have fun on your family mountain biking adventure.